Atascadero is a wonderful place to have a home. It has great scenery, a quick drive down highway 41 to the coast, and a nice small town atmosphere. If you are a homeowner, you know the value of beautiful landscaping. It not only increases your property value by as much as 20%, but with colorful plants, fresh smells, butterflies, a shady patio, or a meandering pathway, it also provides a relaxing and fun environment for you and your family. If you are planning on installing a new landscape or if you are maintaining your existing landscape, you have likely come up against some of the common challenges of landscaping in Atascadero. Hard ground, hot and dry summers, cold winters, weeds, and garden pests are just a few of the difficulties you face. With all of these challenges, it can make going outside and working on your landscape a daunting task. Luckily, you can have all of the benefits of a nice landscape without all of the effort. 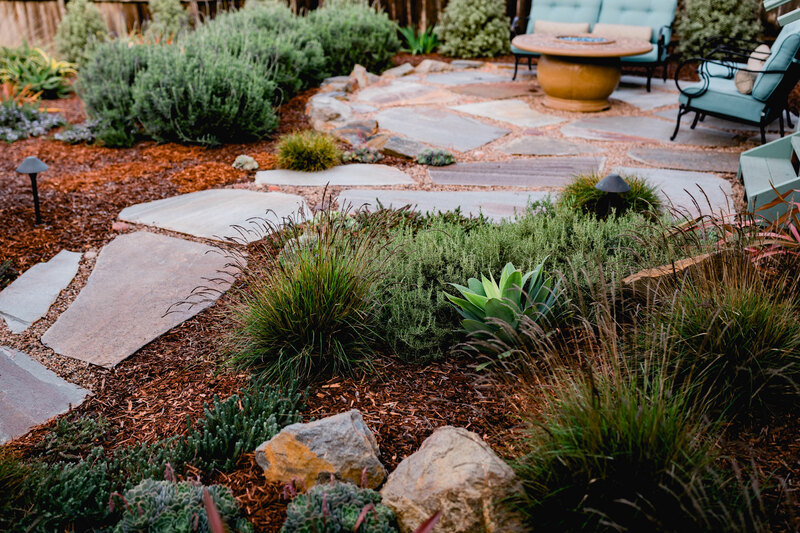 Wild Bloom designs and builds water-wise landscapes throughout Atascadero. We specialize in creating sustainable landscapes that are drought-tolerant and easy to maintain. Whether you want your lawn removed, your existing landscape renovated, or you want an entirely new landscape, we are here to help. Want to Discover More about Drought-Tolerant and Sustainable Landscaping? Click here to read our guide to SLO County lawn removals. Click here to discover some of our favorite low water plants. The design they came up with was perfect for our house and included all of the features we asked for. We really love sitting on the new patio and and admiring the landscaping. We even saved several hundred dollars because of Atascadero’s lawn rebate program. I’d happily recommend Wild Bloom for anyone who needs landscaping work.